Redound hammer is very popular non-destructive testing device and being used form 1948 after devised by a Swiss engineer Ernst Schmidt. The device is generally used to determine elastic properties of both concrete and rock; elastic properties like strength can be measured with this device, but more emphasize are provided to penetration resistance and hardness. According to the name of inventor this test is also known as Schmidt hammer test or Sclerometer test. Unlike usual hardness test conducted on metal rebound hammer test is totally different as it do not leave any indent. 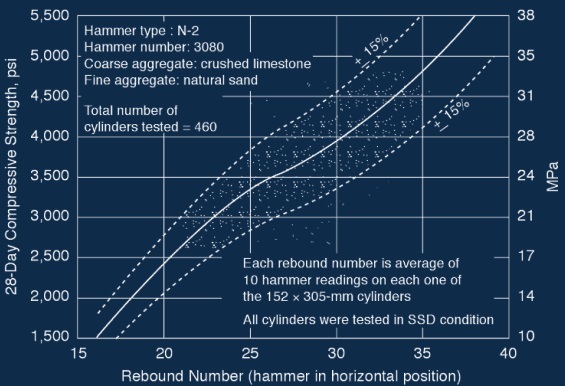 Why is rebound hammer test conducted? • To compare quality of one portion of concrete with another. In case of old building, check up of structural health. Rebound means bounce back after striking something hard through the air. When an elastic mass impinges against a surface it rebounds; the degree of rebound depends on hardness of impinged surface. Rebound hammer test is based on the above principle of rebound; though it looks simple, this test method deals with complex relationship between impact and its resultant propagation of stress-wave. • In rebound hammer, a mass is loaded over spring and can be moved axially along a tubular housing which imparts a defined amount of energy. As plunger is pressed against surface to be examined, the spring is extended from a fixed position. The mass rebounds, upon release, from the plunger which is still remain in contact with concrete surface, the distance by which the mass rebounds is measured and presented as percentage of initial extension (while pressing hammer) of spring. This percentage is known as rebound number. 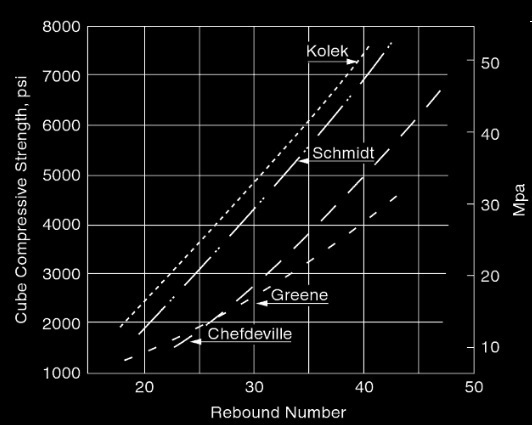 • Rebound number can be determined from a rider which moves along a graduated scale. Some types of hammer will produce printout version of result. The most important thing is that rebound number is an arbitrary value as it depends on size of mass and as well energy stored in spring. 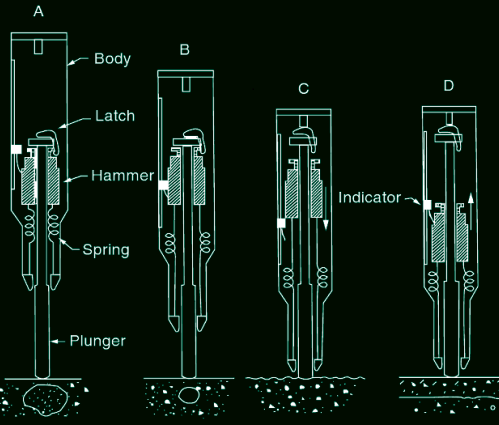 With the push of body, the spring is stretched and when body is pressed to its limit, the latch is released automatically which permits spring to move hammer mass to the plunger tip. The mass driven by the energy stored in spring hits the shoulder of plunger rod and subsequently rebounds. Rebound distance is measured by slide indicator which is devised to travel rebound distance with hammer mass. The plunger is then locked by pressing lock button on the side of body and rebound distance is determined from the scale. Test can be conducted at any angle may be vertically downward or upward, horizontally or it can be pressed at any inclination. As the effects of gravity is changed with test angle, different values of rebound number will be recorded for the same test concrete surface. Thus separate correction or calibration charts have to be developed. Why is smooth surface required for rebound hammer test? The texture of surface is very important in rebound hammer test as it affects results significantly with smoothness of test surface. When a test is conducted on rough textured concrete surface, the plunger tip produces excessive crushing which will reduce rebound number. For more accurate rebound number, the rough surface should be smoothened to uniform textured by grinding. Carborundum stone is the perfect material for smoothening. It was found by Greene (1954) and Kolek (1858) that surfacing prepared against metal forms or a trowelled surface had (5~25) percent higher value of rebound number than this value found for surfaces prepared against timber forms. That means, it test is conducted against such surfaces special correction chart or correlation curve have to be developed. Trowelled surface of same concrete member, moreover, will yield higher scattered values of rebound numbers which implies lower confidence on test results. What should be the age of concrete specimen to be tested? According to Kolek (1958), surface hardness is increased rapidly up to first 7 days of placing concrete. Later the increase in hardness of concrete is very little or negligible. However, under proper curing, significant increase in strength after 7 days is noticed. Don’t be confused hardness as strength. It has been established by Zoldners (1957) and Victor (1963) that for a specimen of eqaul strength, rebound value is higher for concrete at the age of 7 days than that of 28 days. It is very important to make a correlation between rebound value found for an old concrete and compressive strength found from cores of the structure. • On concrete having low strength at early ages. This is due to risk of significant surface damage of weak concrete and obtained rebound value will be too low to have accurate reading. Following figure shows blemishes on test surface due to impact of plunger on 8 hours old and 3 days old cylindrical specimens. How to correlate rebound number with compressive strength? • Take a number of cylinders of standard size (150 mm X 300 mm) designed for strength having range of concrete that will be used in jobsite. It is essential to use same aggregate and cement that will be used on the site and the curing condition of cylinder should be same as that of job site; normally moist curing at room conditions maintaining the same period of curing specimen as that in the field. • According to standard sampling and testing procedure, after capping, specimen is set under compression testing machine and initially approximately 15 percent of ultimate loading is exerted and it is ensured that saturated surface dry moisture conditions are in cylinder. • Take 15 rebound reading on cylinder specimens, on the cylindrical surface 3 vertical lines covering 3600 with three equal interval (1200), in no cases same spot are tested twice. The plunger should be pressed in middle 2/3 of every cylinder. • In case of cube samples, take five rebound reading on every molded faces, again avoid same spot to test twice i.e. reading are taken on four sides. • The average of these readings is taken and is considered as rebound number of the specimen may be cylindrical or cube under test. • The curve or line on the plot is fitted by the method of least square. In the following figure, Zoldners has developed a curve for limestone aggregate concrete which is based on specimens tested at 28 days on cylinder of different mix design. Figure describes calibration curves developed in different countries. Four researchers, Schmidt, Kolek, Greene, Chefdeville has shown that deviation of calibration curves from manufacture provided curve, investigation conducted on rebound hammer type N-2. As discussed above, complex phenomenon is involved in the rebound hammer test. Akashi and Amasak (1984), have made an attempt to understand this phenomena based on stress waves generated during impact on the plunger of Schmidt hammer. They used an specially designed hammer instrumented to have strain gauge with plunger and showed that a large compressive stress wave σi and large stress waves in reflection σr are generated at the center of plunger due to impact of hammer mass. • The rebound number was found nearly proportional to the above ratio of these stresses. Following figure shows oscilloscope trace for the impact stresses on the plunger having initial wave followed by reflected waves. • The rebound hammer should be calibrated on concrete prepared by testing material having constant hardness. • The generated stress waves due to impact should be measured. Thus the concrete surface hardness can be estimated with higher accuracy by determining the impact waves on the plunger. A typical plot of rebound number R Vs. stress ratio σr/ σi is shown in following figure. For a small concrete section selected or specimen like thin wall and beam, 150X300 mm cylinder or 152mm cube, even a little movement due to impact will reduce the rebound reading. So rigidity is an important factor and the specimen or member must be backed up by mass or rigidly held by some means. According to Mitchell and Hoagland (1961), the restraining load on test specimen at which rebound reading is found to remain constant are seems to change from specimen to specimen. However, to achieve consistent rebound reading the effective restraining stress was found about 15% of ultimate strength of concrete cylinder (152X305 mm). Zoldners (1957), Greene (1954) and Grieb (1958) have suggested to apply effective stress of 145 Psi (1 MPa), 245 Psi (1.7 MPa) and 290 Psi (2 MPa) respectively which were significantly lower than the value suggested by Mitchell and Hoagland (15%). Internal moisture and surface moisture content of the concrete specimens have significant effect on results of this test. Zoldners (1954) showed that rebound readings of well-cured specimens dried in air when soaked in water (to ensure saturated surface-dried condition) 5 points lower than that were tested in dry condition. When this saturated surface dry specimen were air dried at room temperature (700F), this recovered 3 points after 3 days and 5 points after 7 days. Klieger et al. (1954) have demonstrated a comparative results of specimens of 3 years old concrete; he found a difference of range of (10~12) points in rebound reading between laboratory dry specimens and that stored in wet condition. 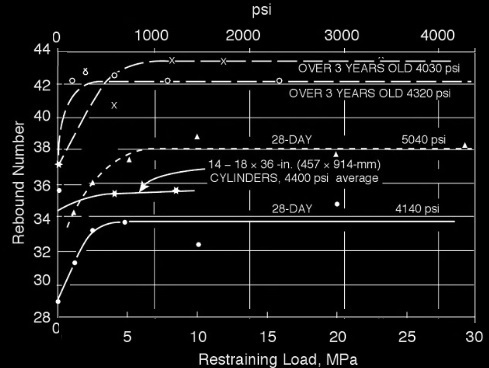 These differences in rebound readings stand for approximately 2000 psi (14 MPa) variation in compressive strength. When the real condition of the specimens or field concrete is not known, it is expected to presaturate concrete surface for several hours before testing and interpret the result from correlation prepared for tests conducted on saturated surface dried specimens. According to Kolek (1969), rebound hammer is affected by type of concrete. Concrete made of high alumina cement may have 100% higher actual strength s than strength obtained using correlation curve produced from test conducted on ordinary Portland cement concrete. 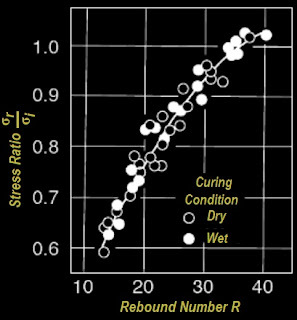 Again super sulfate cement concrete may have 50% lower strength than that attained by using correlation curves based on ordinary Portland cement concrete. In general it is agreed that aggregate used in concrete production has influence on rebound number. Klieger showed that for concrete of equal compressive strength, specimen that have crushed limestone as coarse aggregate, rebound number were about 7 points lower than that have gravel as coarse aggregate which stand for 1000 psi variation in compressive strength. Another important thing is that if you use aggregate of same type but of different source, Grieb (1958) has established that different correlation curves may be required to interpreted compressive strength. Following figure shows outcomes of such study conducted by Swiss hammer on concrete cylinder constructed of four different gravels. It was interesting to see that for an equal rebound value, the correction curves shows variation in compressive strength ranging from 1.7 to 3.9 MPa. Concrete made of lightweight aggregate showed wide variation of results under test hammer (Greene, 1954). As an example, concrete made with pumice aggregate yielded different rebound number, at same compressive strength, from concrete made with expanded shale. But when same lightweight aggregate type is used, the rebound value is proportional to compressive strength. Carbonation is a slow reaction where alkalis exist in cement are converted to calcium carbonate in the presence of carbon dioxide. This process starts from surfaced and gradually moves to deeper into concrete. This process left a layer on concrete surface. 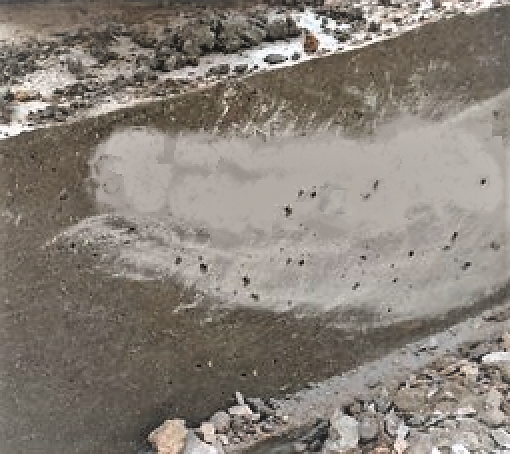 Carbonation of concrete has significant affects on results of rebound hammer test which is found more severe when this layer is several millimeter thick in older concrete and reached to its extremity when more than 20 mm (Kolek, 1969). In this case, the rebound hammer show up to 1.5 times higher value than those found in test surface of uncarbonated concrete. It is suggested to establish compatible correction factors to avoid possible overestimation of compressive strength of concrete. When tests on specimen like cylinder cast in tin can and steel mold were conducted, there were no significant variation in rebound numbers between those; but there have significant difference between those cylinders with cylinders where paper cartoon is used as mold to cast Concrete between steel or tin can. The specimens molded in paper cartoon showed higher rebound number and the possible causes may be reduction in water/cement ratio at surface zone due to withdrawal of moisture from fresh concrete by paper molds. As rebound hammer evaluates surface hardness of the specimens, in this case it may result an unbelievably higher strength due to unrealistically higher rebound number. So a suitable correlation curve is required when paper cartoon or similar types of molds are used in the site to evaluate actual strength that will be produced with actual formwork. Greene and Klieger established correlation between rebound number and flexural strength of concrete and they showed that relationship were more or less similar to that produced for compressive strength but with greater scattered results. For a beam, rebound numbers were taken for on all finished surface of it and an interesting thing was found that rebound number found on the top of surface were 5~15 percent lower than that found on sides of that beam. As in compressive strength, the moisture content and type of aggregate has identical influence on flexural strength of concrete. An attempt was made by Mitchell and Hoagland to establish correlation between rebound number and modulus of elasticity of concrete; but not found any general conclusive correlation between the static modulus of elastic and hammer rebound number. However, an acceptable relationship can be made between two parameters if calibration of rebound hammer is done for each type of concrete. An empirical relationship between rebound number and dynamic modulus of elasticity have been established by Petersen, Stoll and klieger. They concluded that latter relationship is influenced by moisture content and type of aggregate as that it affects compressive and flexural strength.